Under licence from Natural England, Keystone Ecology has been undertaking live capture of Water Voles at a number of sites in Wiltshire where extensive watercourse re-profiling is required. Unlike the usual approach of capture and translocation to an adjacent or nearby receptor site, Water Voles are being captured and held in a specialist breeding facility in Devon before being transferred to their release site in Hampshire. The captured voles and their offspring will play their part in a major Water Vole reintroduction programme to benefit the overall conservation status of the species. At the donor sites, Water Voles are being prevented from recolonising the working areas through a combination of exclusion fencing, installed by Keystone Habitats, and top soil stripping under supervision by Keystone Ecology. Once the bank works are complete, the fencing will be removed and vegetation planted/allowed to re-grow, thereby enabling re-colonisation by the remaining healthy Water Vole populations above and below the re-profiled/enhanced zones. Keystone Ecology are confident that there will be no long term detriment to the local population and the Wiltshire Water Voles will contribute to the enhancement of the national population of this fast declining species. 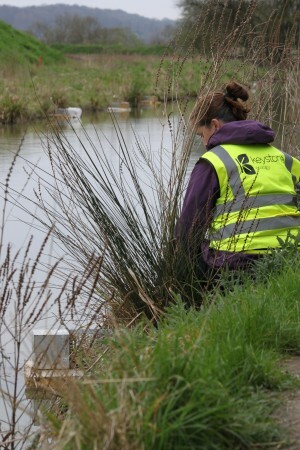 Click here for the BBC News story, here for the Swindon Advertiser story and here (1hr 44mins) to listen to their interview with Dr Sarah Jackson from Keystone Ecology.